Giles & Posner’s NEW Stonebake Grill, the taste of Italy in your own home! The NEW Stonebake Grill from Giles & Posner is a revolution in cooking, allowing you to recreate the traditional taste and aroma of an authentic Italian Pizza, or traditional Mediterranean dishes in the comfort of your own home. The perfect product to cook good food fast, and fun for all of the family! The oven is perfect to cook delicious pizzas in minutes, or to heat up a wide range of different foods including omelets, quiches, bread, pastries and pies. The interchangeable deep dish non-stick pan means that the oven can be easily cleaned and maintained. The oven is simple to use, and it comes with a recipe book full of delicious ideas, and a user guide. The revolving stone can cook pizzas with heat intensified from both below and above for the perfect even finish and a crisper base. The oven has a temperature control that heats up to an amazing 400 degrees cooking your food right through to the middle, and not leaving it soggy as some conventional ovens can. You can use pre-prepared pizzas, dough’s, or dishes or why not be creative and produce your own from scratch! A built in timer insures that the oven can be controlled to suit the different foods that are being cooked; there’s even a viewing panel so you can watch your food cook and check that it’s been cooked to perfection! 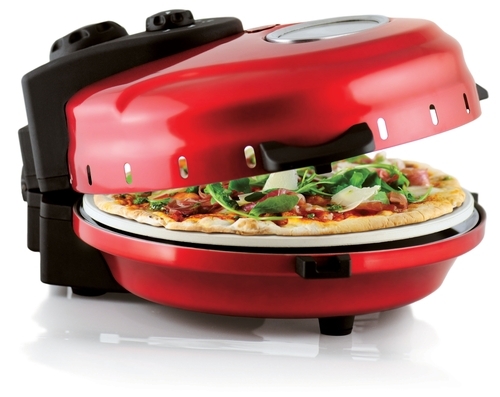 The Stone Bake Grill is just one of the new innovative food entertainment products in the EAT! Range from Giles & Posner; products that are ideal as a gift or party piece. To see other products in the range, to buy online or to find a stockist near you please check out www.gilesandposner.com. Distributors, please email sales@gilesandposner.com for wholesale prices and package deals. Giles & Posner’s New Stonebake Grill comes in Metallic Red, Height 200mm/Width 380mm. This press release was distributed by ResponseSource Press Release Wire on behalf of Inspirational PR in the following categories: Children & Teenagers, Men's Interest, Home & Garden, Women's Interest & Beauty, Food & Drink, Retail & Fashion, for more information visit https://pressreleasewire.responsesource.com/about.